As with dieting for weight loss, exercising for weight loss is not for the faint hearted, you will have to accept that it will become an integral part of your new lifestyle, although it can become enjoyable if approached with the right mindset. One of the best, and probably the easiest, and highly recommended by fitness experts, ways to fitness is through aerobics. There are exercises for everyone no matter what your level of fitness, all done in moderation and at your leisure. We will be looking at aerobics in more detail in the following pages under EXERCISE. There’s no room for procrastination! 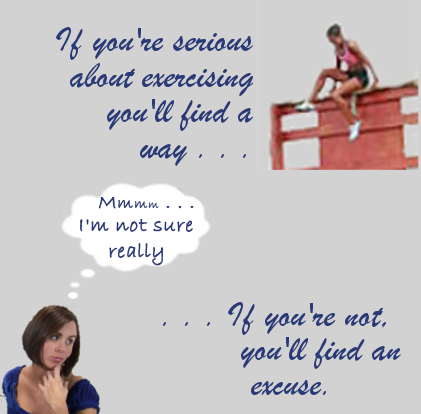 Excuses such as “I just don’t have the time”, is no excuse. If you want a fitter, healthier you, you will find the time! There are some lucky people (a tiny minority) who don’t suffer from weight gain but, as well as a healthy diet, they still need some form of exercise to stay fit and promote good health, so don’t believe exercising for weight loss is only for the overweight or obese. Do I really need to exercise to lose weight, can’t I just do it by dieting? Yes, you can, but I wouldn’t recommend it. Exercise not only helps keep up your fitness levels but is also an important part of any weight loss program. Why? It burns calories! Ideally, if you are reducing your calorie intake by, say, 500 calories daily, half, 250 calories, can be done through your diet and burn the other 250 through exercise, a win-win situation. You can eat a little more of what you like and at the same time improve your fitness levels. Exercising For Weight Loss: How Much How Often? How much how often will depend on your current level of fitness. If you are reasonably fit, light exercise for thirty minutes, three to four times a week, is recommended, gradually increasing the time and frequency as your fitness levels increase. For the majority of overweight and obese people, fitness levels will be pretty low, or none at, all having done little or no exercise over a long period of time. For those who are only moderately overweight you will probably be able to start building up your fitness slowly, but for those who are excessively overweight, obese or morbidly obese there may be problems. Being excessively overweight or obese can make it extremely difficult exercising for weight loss. Sufferers can have mobility problems, such as rising from a chair and being able to walk only a few yards (or meters) before becoming breathless. If you are one of these people, a specially designed diet will, under medical supervision, probably be needed to quickly reduce your weight to a level where some form of exercise is possible. Once this has been achieved a fitness program designed by a fitness expert may be necessary to build up your fitness levels before being able to exercise independently. These specially designed diets and fitness programs can sometimes be expensive, although in the UK, I’m not sure about the US and other countries, the NHS (National Health Service) run free clinics that deal with weight problems. Consult your doctor, who may refer you to your nearest NHS weight loss clinic. Unless requiring a specially designed fitness improvement program, exercising needn’t be expensive, in fact it needn’t cost you anything at all. Walking, jogging and running are all natural instincts and are probably the best way to burn calories. In the UK, the NHS, in conjunction with some local councils, may provide free or heavily subsidized access to swimming pools in an effort to promote health awareness. It’s worth looking into, there’s really no need to join expensive keep fit clubs and gymnasiums. Although running may be the best form of exercise to burn off the calories and reduce body fat quickly, it can also reduce lean muscle, which is needed to keep your body trim and in good shape (literally). Whatever way you decide to exercise for weight loss, to avoid losing muscle, some sort of strength and weight training should be incorporated into your program. Again, this need not be expensive, there are many ways you can improvise with everyday things you have around the house. For instance, don’t throw away those two liter (four pint) plastic milk bottles that have handles. Fill with water to a weight you feel comfortable with and you have ready-made dumbbells. As you gain strength in your arms you can increase the weight accordingly by adding more water or sand. As with exercising, start strength and weight training slowly, gradually increasing the weight as you gain strength and muscle mass. Increasing your muscle mass (you don’t have to look like Mr or Miss Universe) will increase your metabolism and help burn off calories. 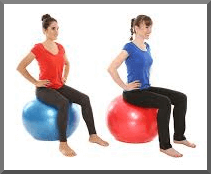 In the pages following Exercising For Weight Loss we will be looking at more free and inexpensive ways you can use everyday things you have around the house as aids to strength and weight training. The content on the following pages of Exercising For Weight Loss is for information only and not meant to offer advice medically or otherwise. Before any change in diet or exercise, please take appropriate professional advice.